Okay, so first I have to say that I've been trying to post all weekend and "blogger" wouldn't let me for some reason. I hope everyone had a very Happy Easter. I'm so glad that my Savior is Alive and Lives Forevermore! I went to a Newsong and 33 Miles concert in my hometown and I must admit that I am pumped! There is nothing like worshipping with believers all around! It was awesome. With that said, On to Zoo...this was our last week of zoo "stuff" and it was so much fun. Let it roll! My kids did so well on this....go K's. And, our tallying has gotten so good too! Our math coach was impressed. I think was my favorite page I added...this or the kangaroo. Look how huge a gorilla's hand is! 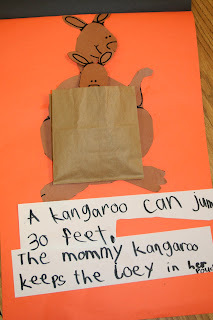 Did you know that a kangaroo can jump 30 feet in one hop? That's the length of our classroom. 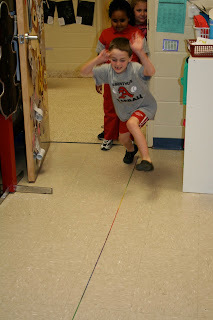 We measure out 30 feet, then we hopped just to see how far we could hop in one hop. 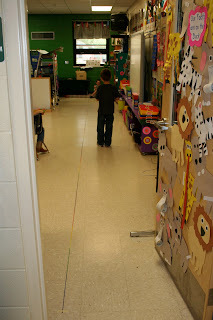 We also measured out our own 30 foot piece of yarn to go with our fact page. We made bunnies like on kinderbykim, but my friend Vickie had a great idea to use eggs...so I let the boys do carrots and the girls do eggs. 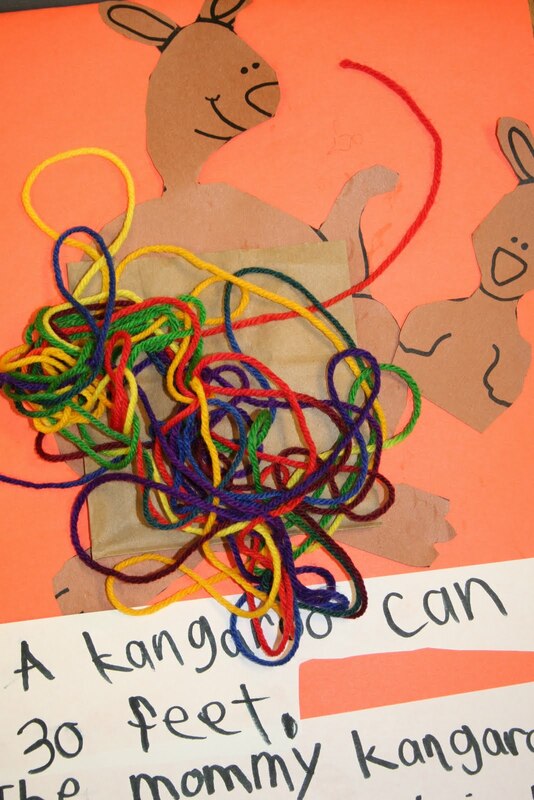 Our hippos from Deanna Jump's zoo unit, but we added a fact to the back. I found these cute little trash cans at Target. We didn't have a chance to do our activity, but we will this week...I have facts about each of these animals that we will sort. So many good ideas....!....the counting by fives activity will be on my lesson plans this week. Where can I find the printables? I love all of your zoo ideas (from both posts)!! Would it be possible to send me the recording sheets? I would be happy to donate to donors choose! Thanks so much for your last zoo stuff!! I would love to have a copy of this zoo stuff, too!! My kids are loving every minute!! You are amazing!! Would you mind sharing again? My kiddos are in full swing using some of your farm stations - and loving it! You are a very generous person! As a side note - I agree, it is so great to go to some of these concerts. I went with my girls to the Christian youth weekend at Silver Dollar City and we saw several great bands. (Abandon, Sanctus Real and more) I think I was equally as excited as they were about the music and the worship! AWESOME!!!!! SO SMART! 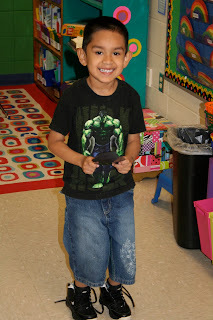 I just took some of your ideas and made them fit into our "under the sea" unit we are doing! Thanks! 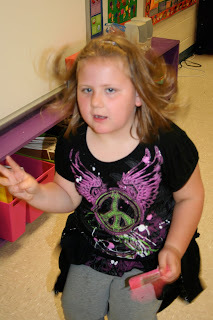 I am so into work stations, the kids work so well and learn a lot more. THANK YOU THANK YOU THANK YOU again for sharing! Is this set of zoo stuff different than the zoo part one post? If so, I'd love to get a copy of your printables as well. I love "hopping" out words! 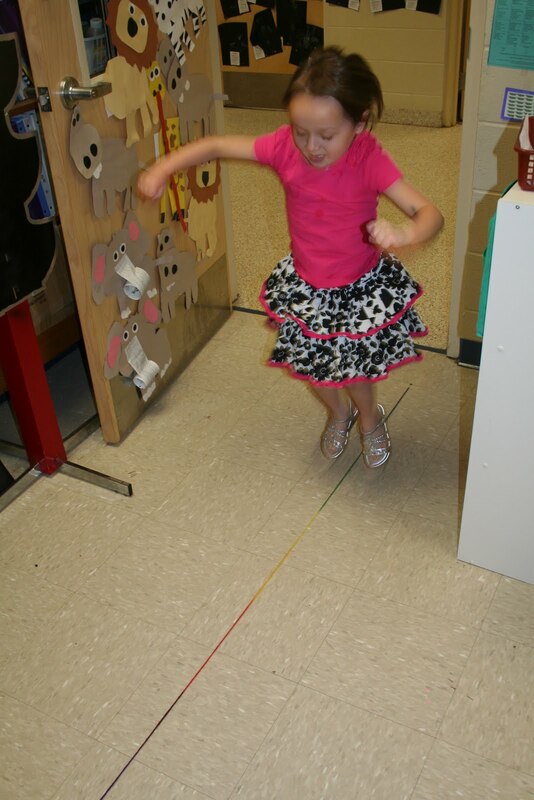 Kinders think it is sooo fun! And I think holding children accountable for their work is so important. I would love a copy of these printables as well. We are pretty low on colored construction paper at our school. Does your school order enough or do you end up buying a lot of your own? I see you have some colors my school has never even had and I love it. Looks like I will have to buy more, more, more! 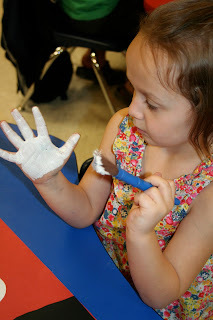 Kindergarten is sooo much work because of all the "things" we have to make but it's so worth teaching them at this amazing age! Thanks for your constant motivation! This is great Julie.....I have already started making your units...YOU ARE THE best....Im not sure if the Zoo 2 part is with the Zoo part 1..if not may I have a copy., I love what you do..You inspire all .Thanks for everything you do. Darci..
love them and would like them! So CUTE!!! I love all your great ideas! I would love a copy of your zoo ideas! Thank you so much! You know I love everything you do! You inspire me to be better. I would love a copy of anything you are willing to share. Your lessons and activities look great! I would love a copy! Thank you for sharing!!! Your ideas insprire me and push me to be the best I can be. I have already downloaded zoo1 and in the process of making my lesson plans. When will zoo 2 be available for purchase. 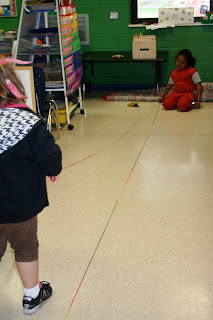 I am anxious to get busy making things and preparing for an amazing zoo unit. I would be honored if you would send me the Zoo 1 and 2 sheets. I love all you do. 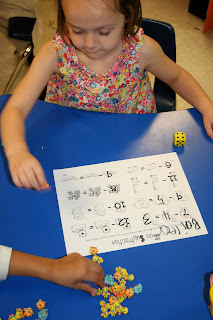 I am using some of your farm stuff this week and I am loving seeing how well my kids are doing with the counting, money, and sorting vowels sounds. Thank you for all that you do. Hi Julie!! Once again... you have made the cutest center activities!! I am doing my zoo unit soon and would love to get copies of both zoo 1 and 2. Thank you for all that you do!! yet again you ROCK the the zoo too!! I would love to have anything that you would be willing to share -- how FUN is that!! Where did you get the fun zoo clip art!! I think I will spend the summer figuring out FUN clip art!! How awesome is that!! Thanks for all you do for your students and for motivating others!! Such cute center ideas! I would love a copy of your Zoo units! 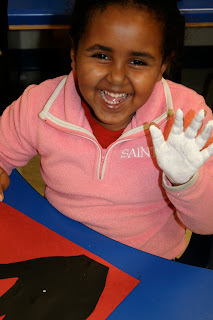 I am a new blog follower and have fell in love with your center activities. I like how most of them have similar expectations so students already know what they need to do. If you don't mind sharing, I would appreciate a copy of your zoo unit. I am planning on finishing up our school year with this thematic unit and would love to spice up my current unit. My class is going to love the kangaroo activity. Are the "pouches" that you used just brown lunch sacks cut in half? Your zoo unit looks super fun! Would love a copy if you are willing to share. These look great! Would love to get a copy of zoo 1 and 2. Thank you! Hello Julie, thank you for this wonderful blog! Can you please send me a copy zoo 1 and zoo 2! You have such amazing ideas! Do you sell your stuff on TPT? So cute! Please send me a copy. Thank you so much being willing to share so many great things. Hi! I love all the zoo things!! If you are sharing copies of zoo things could you please send me whatever zoo stuff you can? We went to the zoo today!!! 1st year kdg teacher here loving your creativity and passion! Thanks! Your zoo ideas are so cute! I would love a copy of your zoo activity sheets. Thank you so much!! Hope one day that I will be able to share also. Thank you for sharing! Would love a copy of your zoo activity sheets. Thank you! What wonderful ideas! I would love a copy of your zoo printables if you are willing to share. Julie, I love all of your ideas! If you get a chance I would love any of the printables you have! Thank you for all of the ideas and help! I would LOVE a copy of your Spot the Giraffes (where they write the number and tally) and the alligator ending sounds! Thanks so much for all of your great ideas and inspiration! Just found your blog today. Love your ideas. Would love a copy of your zoo sheets. Your zoo unit looks great! My k team would appreciate your printables as well if you are sharing! Thanks for being willing to share your talent with others! I love your ideas for the zoo unit! Where did you get your animal pictures that you use for the center? They are very cute! I'm also interested in your Kangaroo syllable sheet. Can I get that somewhere? WOW! I love all these ideas. It also doesn't hurt that I am a huge elephant lover, so anything elephant greatly appeals to me. Thanks so much for sharing your ideas. If you don't mind sharing, I would also love copies of your recording pages. Wow - this unit is amazing! I would love a copy if you don't mind. Would LOVE copies of these fabulous zoo items, if you're still sharing (or if you're selling on TPT, please let me know). You have the BEST ideas!!! I love your zoo stuff and have looked in your tpt store but can't find a zoo unit! Am I missing it? I would love copies! These are such amazing ideas! 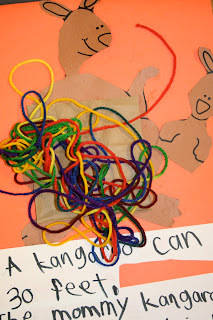 I would love a copy of your zoo unit as I will be doing one with my class in a few weeks! Your ideas are so creative and inspiring!!! Thank you. Are you still able to email your sheets and information for the zoo activities in your posts? 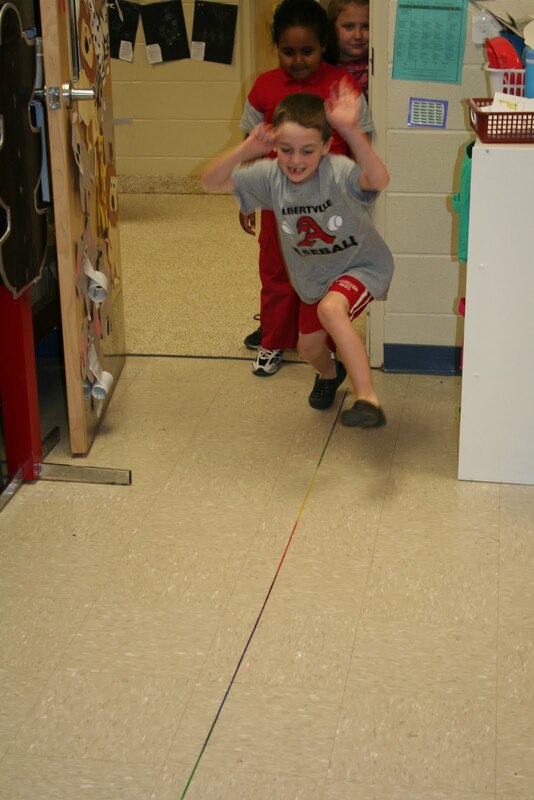 I am putting a thematic unit together for the zoo and would like to borrow some of your ideas. You are very talented and have great ideas in your post. Thank you. I LOVE your zoo stuff! Im a new K teacher (first grade for 5 years) and so I don't have any zoo stuff. We began our zoo unit on Monday and are going to the zoo next Thursday. I'd love to have a copy of your pages if all possible. I just found your blog and I love it!! vigibson@yahoo.com Thank you tons!!! Your ideas are so cute and fun. I am getting ready to do a zoo unit and would LOVE a copy of your activities. I searched TPT and only found the animal masks, but would love the other activities too. My email is footestep@yahoo.com. I also was looking for your zoo activities but I couldn't find the ones above. I would love to purchase the ones above! Thanks! I love your website! I just looked at your TpT site and couldn't find any of the recording sheets you made. If you put them on the site let me know because would like to purchase them! Wow Your stuff is great! Would you please share the recording sheets? I am an Ar/Science teacher and a mentor and would really love to have them!